The characteristics of a nyckelharpa are often defined using 3 categories: sound, playability, and fit & finish. The first two of these are the most important. •A sound that at the same time is full and warm but has a noticeable brilliance and sharpness. Many traditional players in Sweden prefer the brighter sound of a solid A string. Many players outside of Sweden prefer the warmer sound a wound A string provides. The sound should be pleasing to the player. The type of wood on the back of the instrument affects the sound as well. Playability: The instrument should fit the player’s body size. The keys should move freely. You should be able to fully tune all strings and all keys. You should be able to play double stops easily. You should be able hold down multiple keys along the same row. There should not be keys that buzz. The arc of the bridge should allow for easy bow transitions between strings. Extra keys provide more options for range and playing double stops in higher hand positions. An extra row of keys will typically provide an extra half octave of range and make the playing some typess of music easier. 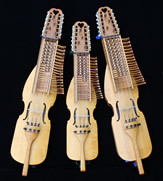 As of 2012, the current desired weight range for a 3-rowed chromatic nyckelharpa in Sweden is less than 1.9 kilograms (4 lbs. 3 oz.). Any new instrument over 2.0 kilograms (4 lbs. 7 oz.) is considered heavy by current Swedish standards. In 2009 we were told that an instrument should be less than 2.2 kilograms (4 lbs 14 oz). Basically, any 3-rowed instrument 5 pounds or more is considered heavy. The nyckelharpa is often played hanging from a guitar strap around the neck. Even a light instrument can sometimes cause significant discomfort in the upper back and neck. Fit and Finish: The instrument should look acceptable to the owner/player of the instrument. In Sweden it is expected by many that the fit and finish will reflect that this is a “folk” instrument. Many instruments are/have been built by people with limited woodworking experience. It is expected in the Swedish folk music community that instruments will be on the rough side.